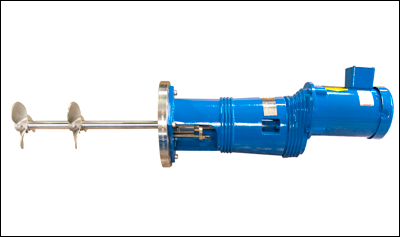 Side entering mixers are particularly well suited for use in large tanks, in applications where headroom is lacking, or in tanks too deep for top entering units. The mixers operate efficiently in most fluids with viscosities to 10,000 CPS and are used for blending, heat transfer, and dispersion of suspended solids. Gear driven models are offered with motors up to 3 HP. Propeller sizes and mounting configurations are the same as those for standard flange mounted models. Side entering mixers for pressurized tanks to 150 pounds maximum may be specified with stuffing box to maintain tank pressure.